The British housing crisis: is EU migration also responsible? Let us get down to brass tacks: Britain has a serious housing crisis. When demand for housing (people wanting to rent or buy) exceeds supply (the stock of housing) the effects are not good for society. House prices and rents rise, making it difficult for people to pay for their accommodation. This reduces the net income available for other things, makes people anxious and directly affects their quality of life. If people migrate to the UK or wealthy foreigners invest in the housing market, this reduces the housing supply for the domestic population unless construction goes up. This drives-up house prices and the levels of frustration, especially when people have to share their homes with their parents/children, are priced out of living in their communities or see empty houses that are investments, rather than homes. This is especially so in Britain, a nation of home owners and this state of affairs leads some to conclude that the housing crisis is caused by the EU and its freedom of movement principle. It leads to a perception that perhaps EU mobility results in a lack of housing for the native population. This is powerful argument during the period leading up to the EU referendum in June 2016; it connects with the EU immigration and EU benefit tourism, topics I have previously written about, and is presented as another reason for Britons to vote to Leave the EU (i.e. Brexit). So it is important to address the nature of the British housing crisis and the EU’s role in it. The first thing to be said is that there is no shortage of analysis of either the housing problems or the possible solutions, but the latter basically boil down to balancing housing demand and supply, together with the political will to solve the crisis. Numerous factors influence housing demand. A critical factor is price: at higher prices, real incomes fall and people will reduce their demand while alternatives to owning a property, such as renting, become more attractive. There is a multitude of other factors that are important, such as population dynamics (population size, migration, birth and death rates, age structure, etc. ), incomes of households (some may shift from renting to buying, move to a bigger property, buy a second property, a holiday home, etc. ), social and lifestyle trends (e.g. late marriages, divorce rates, decisions to remain single, etc. all increase single households and thus demand), availability of credit and interest rates (higher rates make ownership less affordable while lower ones achieve the opposite and restriction in the supply of credit reduces demand for housing and can lead to a fall in house prices) and other influences such as government incentives (to buy, to rent or to buy to rent) and expectations in terms of house /land price developments (speculation). Since all the above influence housing demand, estimating future demand is a complex process. What is simple though is that immigration, whether from the EU or elsewhere, is only one factor among many others, the majority of which are more influential in terms of stimulating demand for housing in the UK. EU migration is not a one way street and not all roads lead to London and the South East. In the same year, 321,000 people left the UK, a proportion of which migrated to other countries in the EU. Consequently, even if EU migration was the only issue affecting demand for housing, which is clearly far from being the case, EU migrants do not constitute the majority of immigrants to the UK. Furthermore, the same process is happening in other EU countries that receive Britons. A number of housing demand studies demonstrate the same trend in the UK: housing demand is increasing significantly and the government and the rest of the housing system, not least the planning system and the construction industry, need to respond in order to ensure that the supply covers the future demand. After all, it is not unusual for populations to increase and housing policy and system must respond in order to deliver affordable, quality housing. The public has the right to expect this irrespective of the particular set of factors that may drive housing demand (i.e. whether immigration is an issue or indeed whether it is from the EU or elsewhere) at a particular point in time. A comprehensive estimate of housing need and demand in England was published by the Town and Country Planning Association. It estimated that England alone required 240,000 – 245,000 additional homes each year until 2031 in order to meet rising demand. Many similar projections have been made long before EU migration to the UK became an issue of debate post-2007. The issue then is how much housing is being built and is it sufficient to meet the demand for 245,000 new units per annum? The UK housing construction data (supply) are presented in the Table below. If here is such a systematic lack of construction, then surely the respective people in charge of housing policy, finance, planning, construction, etc. are responsible. Despite mounting pressure, regular public outcries, evidence of shortage and affordability problems, etc., the UK only managed to build a paltry 150,000 housing units in 2014-5. This is a damning indictment of Britain, not least its politicians, policy-makers and industry. It is up to each individual to form their own opinion of where the blame for Britain’s chronic housing crisis should rest. Scapegoating EU migration (which took off from 2004) for problems which have been systematically neglected in the UK amounts to a disgraceful attempt to blame others for issues which Britons have failed to tackle over and over again and are still doing a miserably bad job with. In this context, it is worth addressing two issues which policy-makers, politicians and the Leave the EU campaign will almost certainly raise in defence of the indefensible: the lack of adequate and affordable housing in the UK, which is a basic human right. Many, if not most, Britons appear to be convinced that the UK is a very crowded island and that there is simply no space left for housing construction, let alone to accommodate migrants from the EU or anyone else. Certain segments of the media that are biased against the EU, as well as the general Leave campaign, including populist political parties, are keen to emphasize this argument, so let us examine the claim. The most comprehensive analysis of this issue (UK National Ecosystem Assessment) concluded that only 6.8% of the total land area of the UK is urban (10.6% of England, 1.9% of Scotland, 3.6% of Northern Ireland and 4.1% of Wales). But being urban does not necessarily mean that it is built upon since such areas also contain gardens, lakes, etc. The most detailed analysis ever conducted found that only 2.3% of England is built upon, the rest is natural. Elsewhere in the UK, the figure is less than 1%. Contrary to popular misconception, only a tiny fraction of Britain has been concreted over. Britain is not a crowded island. It can and must build more housing for the benefit of its citizens. Another common perception is that EU citizens are benefit tourists, and that they strain the welfare state by having a higher demand for social housing. But the data show that about 17% of UK-born and 18% of foreign-born individuals live in social housing. That means that foreigners are on par with native Britons when it comes to access to social housing. However, when it comes specifically to EU migrants, the popular perception is even more incorrect. 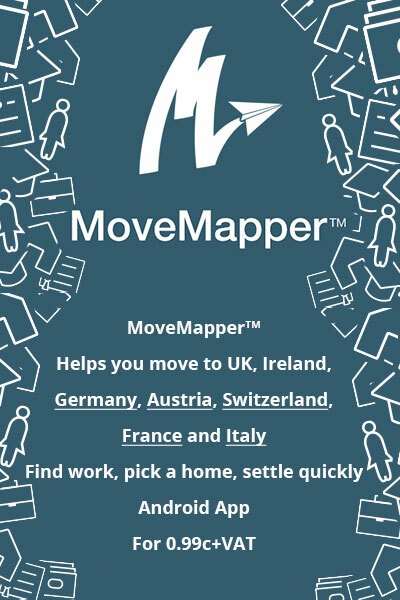 Studies demonstrate that citizens of EU-8 countries who arrived in the UK after accession are 57% less likely to live in social housing than native residents. More recent studies indicate that over 90% of immigrants in the UK are in households that are eligible to apply for social housing (p.3) and confirm that EU (and EEA) citizens are less likely to be in social housing than Britons. The research also shows that, once factors like the demographic structure, location and economic circumstances are taken into consideration, immigrant households are significantly less likely to be in social housing than equivalent native households. Another popular myth bites the dust. The housing crisis is fundamentally a matter of demand and supply and the policy choices each country makes about how to prioritize public investment and other policy decisions. For decades Britain has emphasized home ownership as the one and only housing policy priority. It has constrained social housing construction for ideological and financial reasons, while at the same time forcing social housing to be sold at discount. Its recent policies have stimulated a boom in buy-to-rent, which has increased private renting but also boosted house prices and exacerbated the affordability problem. At the same time, policy makers have not stimulated the planning system to release sufficient land for housing construction, mainly due to the NIMBY (Not In My Back Yard) syndrome. In the meant time, the construction industry has shown much more readiness to speculate in order to accumulate, rather than increase construction efficiency, productivity and quality. None of this has stimulated housing supply greatly while housing affordability has declined. Housing is a matter for each of the 28 nation states of the EU. Some countries, like Germany, build enough housing to meet the needs of their citizens whose quality of life is significantly improved by having sufficient, high quality, affordable homes to rent and/or buy (the recent refugee crisis could not have been planned for in advance. By definition, a surge of 1.1 million asylum seekers in 2015 was not part of the housing forecast). Others, like Britain, do not build enough housing. This is not because of insufficient land, EU freedom of movement of people or other handy excuses for systemic failures on the part of British politicians and their policies, the British planning system and the British construction industry. Any such interpretation amounts to the politics of scapegoating others for one’s own glaring failures and I, for one, will have no truck with it. Is the EU responsible for the British housing crisis: The British housing crisis has been decades in the making. Strong EU immigration is a relatively recent phenomenon. 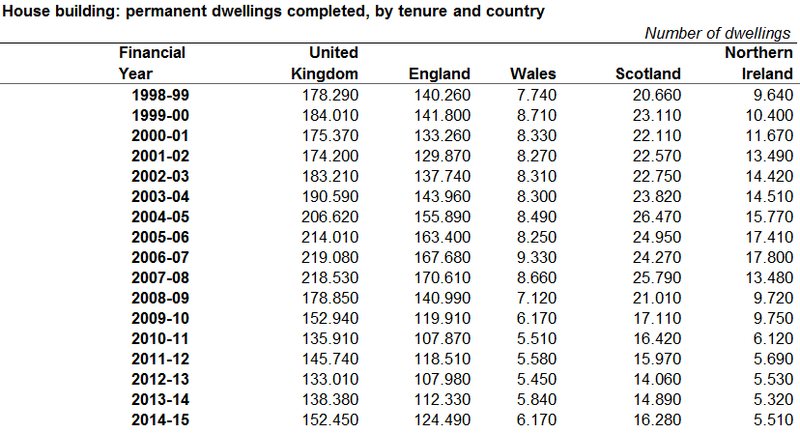 Is the British government responsible for the state of British housing: Its policies have focused almost entirely on housing ownership (tenure), rather than housing construction. Should I vote to leave the EU because of the state of British housing: Britain alone is responsible for regulating demand and supply to deliver sufficient and affordable housing. How extensive is EU benefit tourism in the UK anyway? A cursory reading of Britain’s most popular newspapers might leave the distinct impression that immigrants, especially from the European Union (EU), are beating a path to the UK specifically in order to take-up welfare benefits, live in social housing, avail themselves of the health system and generally live the high life on the back of the hard-working citizens of the UK (i.e. benefit tourism) who actually pay taxes and thus subsidise the lives of such EU citizens. Immigration generally is “the” issue of the forthcoming EU referendum and if the above characterisation of the situation remotely reflects the truth, I would be campaigning to leave the EU too. Not surprisingly this is one of the key arguments of Eurosceptics and Brexiteers in the debate over the future of the UK in the EU. So this post examines the extent to which the EU freedom of movement of people contributes to benefit tourism in the UK. EU migrants sponging off Britons? There are four fundamental freedoms in the EU which are designed to create a common market in Europe, namely to: sell goods, sell services, invest and work anywhere in the EU. Britons have no issues with the first three freedoms but remain deeply concerned about the fourth. The first point to note, as discussed in the previous post on EU immigration, is that the freedom of movement of people is not possible for seven years upon joining the EU, unless a nation chooses to opt-out as the UK did (together with Ireland and Sweden) in 2004. So, for example, the Croats will not be able to work in the UK until 2020 unless a country, such as Germany, decides otherwise. This is to ensure that there is not a rush out of a country that joins the EU. The second point to note is that out of the 508 million people in the EU, only 2.2% of them chose to live in another country of the EU. There is clearly no mass exodus of people from one EU country to another. The third point is that though the UK is indeed a very attractive country to move to, it by no means the only one or even the main one in the EU. In terms of net migration (those arriving minus those leaving), the countries with the largest net inflows of foreign nationals were Germany (452,000), UK (267,000), Italy (235,000) and France (71,000) in 2013. The reality is that the more economically dynamic a country is, the more it is likely to attract people looking for work or to improve their lives. Turning specifically to the issue of benefit tourism, the evident suggests that EU citizens come to the UK to study, work or to join their families, rather than because of the allure of the UK’s social benefits. This is illustrated in the graphic below, which shows that family reunion used to be the dominant entry route. Student inflows became the main reason for entry, but this has fallen significantly in recent years, something which is connected with the Conservative government’s drive to cap net migration at 100,000 per annum. 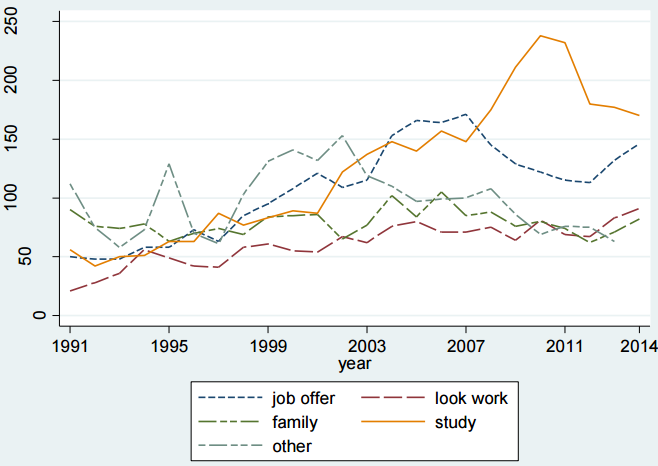 Most immigration from the EU is for work-related reasons, whereas most immigration from outside the EU is for study-related reasons. Furthermore, the same study shows that immigrants are better educated than their UK-born counterparts and that the educational gap is actually increasing over time over time. The “old” Europe or EU-15 migrants are twice as likely to be graduates and the “new” Europe or EU-8 migrants (the 8 Central and East European countries that joined the EU in 2004) are also more likely to be graduates than the UK-born, and most others have intermediate levels of education. “There is still no evidence of an overall negative impact of immigration on jobs, wages, housing or the crowding out of public services. Any negative impacts on wages of less skilled groups are small. One of the largest impacts of immigration seems to be on public perception.” (2015, p.1). But even if there is little or no evidence that EU immigrants to the UK reduce jobs and wages, housing or other public services (housing and health services are discussed in subsequent chapters), this cuts little ice with the Leave campaigners. They maintain the “benefit tourism” rhetoric in relation to EU migration, stressing that an unspecified proportion of EU migrants come to Britain specifically to take advantage of its generous welfare state. To be fair, such belief is not unique to Britain. In Germany, similar pronouncements are regularly made by the CDU/CSU, the mainstream right of centre parties, as well as the Alternative für Deutschland (AfD), a fast growing populist party. The AfD is the equivalent of UKIP. It wants to leave the Euro, rather than the EU, while also stopping benefit tourism and the flow of refugees to Germany. Both parties are aided and abetted by segments of the media in driving a general notion that EU benefit tourism is pervasive, unfair and must be stopped forthwith. What exactly is the scale of EU benefit tourism? A detailed report (ICF GHK and Milieu Ltd, 2013) concluded that non-active EU migrants represent a very small share (0.7% – 1.0%) of the total population in EU Member States. The evidence is that non-contributory benefit payments to immigrants account for between 1% – 5% of all benefits paid in France, Sweden, the Netherlands, etc. and above 5% in Belgium and Ireland. However, the share of non-active EU migrants is very small, both in the UK (1.2%) and in Germany (1.1%). Other research examining recent EU immigrants to the UK of working age who are not students, not in employment and not in receipt of state benefit, estimates that this group amounted to 39,000 people received any benefit, including child benefit. To put this in perspective, this is only 1% of all recent EU nationals in the UK who are of working age, not students, not in employment but in receipt of some kind of state benefit. Since non-EU immigrants typically cannot access benefits until they have been resident in the UK for five years, it is unlikely that they would migrate with the intention of accessing state benefits. 19,579 families had Child Benefit awarded for 32,408 children living in EEA states, around two-thirds of whom were in Poland. 7,026 families had Child Tax Credit granted in respect of 11,762 children in EEA member states. Whatever the Leave EU faction and segments of the media may claim, EU benefit tourism, to the extent that it exists, is much lower than the native population’s own use of such benefits. This reinforces the point that EU nationals come to the UK to work, not to sponge off Britons. Benefit tourism is not worth getting worked-up about, unless it is for cynical political reasons. People generally emigrate due to the prospect of employment and better wages, rather because of the lure of welfare benefits. The EU migrant population is younger and better educated than the average Briton; the unemployment rate among EU migrants is also lower than that of the average Briton. When the figures for both non-EU and EU migrants are analysed, it is hard to avoid the conclusion that the benefits tourism hysteria affects very people from the EU living in the UK. This is a storm in a tea-cup whipped-up by those that seek to pander to popular misconceptions rather than standing-up to them. Benefit tourism, whether from the EU or elsewhere is largely a myth. It is not only that not many migrants are eligible to get benefits in the UK. It is that the great majority of EU migrants actually pay more than their share and take very little out in the form of benefits of any sort. EU migration is good for the tax man and for the welfare state in Britain. Is the EU responsible for the level of benefit tourism in the UK: No. It only guarantees freedom of movement and equal treatment of all EU nationals. Is the British government responsible for benefits eligibility in the UK: Yes. For UK and non-EU nationals; partly for EU nationals, but the recent renegotiation has resulted in a decision to tighten-up eligibility rules for EU nationals living in Britain. Should I vote to leave the EU because of EU benefit tourism: No. The numbers of people involved are small and proportionately much lower than the native British population claiming benefits. The British voter will soon be asked to decide on whether Britain will continue to have a future as part of the European Union (EU) or to exit it (i.e. Brexit or British Exist). The EU referendum’s date has not yet been fixed and must happen by 2017, but is widely speculated that it is going to be to be scheduled for mid-2016. Should the United Kingdom remain a member of the European Union or leave the EU? This is a simple question with simple options, but it nevertheless is a historic referendum that will influence the future of the UK (and that of the EU itself) for generations to come. I am a British citizen who lived, studied and worked in Britain. My parents, sibling and my closest friends remain in Britain. Nevertheless, during the last 20 years, I have lived and worked in numerous countries of the EU and elsewhere. I am married to a German and my business takes me regularly to different parts of the EU, potential future EU countries and beyond. I understand what the feeling is about the EU and that there is frustration with the way the EU is perceived to be interfering with British sovereignty and especially about the freedom of movement of people, which is widely seen to be adding to the social pressures in the country. If I were about to cast a vote at the forthcoming EU referendum, I would feel apprehensive about it. If I were to believe what a hostile media and populist politicians stress, my gut reaction might be to vote for Brexit and leave the EU. I might not be greatly enamoured by the current state of the UK economy, the ongoing austerity, the decreasing wages and the job insecurity. I might well be hearing about the number of laws and regulations emanating from “Brussels”, which the shorthand for the EU, with the implication that Britain no longer controls its own borders and sovereignty. I might well be tempted to conclude that the EU is indeed to blame. Furthermore, I might also be frustrated by my inability to get on to the first rang of the housing ladder while others point to migrants from the EU are taking up the supply of housing that I or my children want to make use of in our own country. This might lead me to concur with those that point to the “uncontrolled” borders and the EU migration caused by the freedom of movement of people. A similar argument is applied to the pressures in the health and education systems, and I might also be concerned about the “swarms” of EU migrants taking-up scarce resources that we are entitled to, since we are the ones who are actually paying the taxes while the others jump the queue and coin the market for social benefits. In short, if I were to believe all of the above, I might be well disposed to giving “Europe” a bloody nose, just as populist politicians and the media are urging me to. I might vote to leave the EU: Britain was great on its own and can be once again. Is the negative portrayal of the EU and all the criticism connected with it correct? Is it too simplistic to say that the EU is to blame for all the challenges in Britain? Is Britain indeed so tied-up by the EU that it is no longer in charge of its own destiny? Are there only costs to being one of 28 member of the EU? If something sounds too simple to be true (it’s the EU, stupid! ), then perhaps it is really is too good to be true. 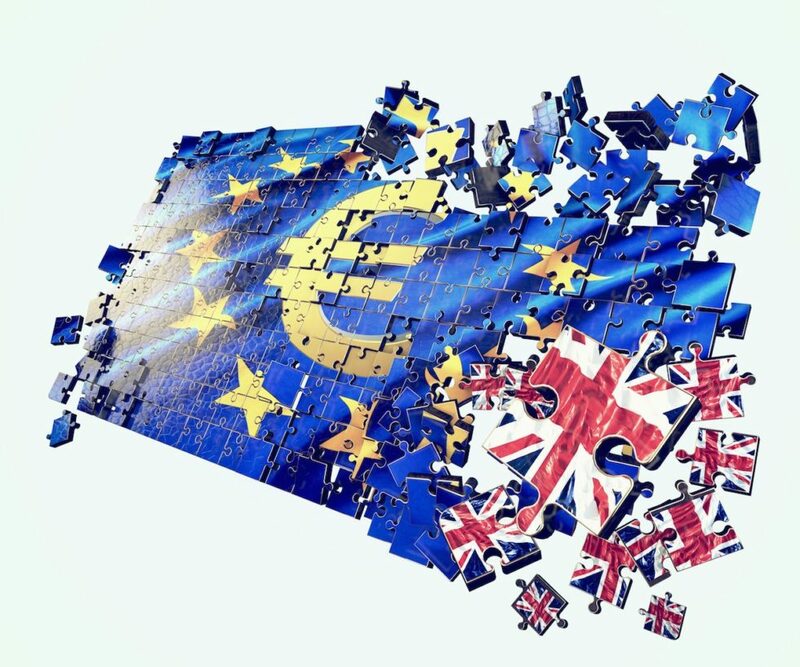 Simple solutions to complex problems are appealing but can the EU really be the fount of all of Britain’s ills and will the country really be better off immediately upon Brexit? Looking at it through another lens, the fair-minded British voter might ask whether it is reasonable or not to only see “Europe”, “Brussels” and the “European Union” only in a negative light? Can it really be that Britain is only paying in but getting nought out of the EU? And, if things are not quite so black and white, what exactly are those positives that are so rare to hear about? Are the benefits so abstract that the ordinary voter simply cannot grasp them or related to them? We all instinctively know that there are two sides to every story but the media and the loudest politicians do not excel at presenting the pros and cons. As a Brit with a foot on both camps, I hear a series of populist myths being peddled again and again. I often smell a red herring when I turn a newspaper pager. I often see the EU being used and abused by those who would attack a straw man. Is EU migration a good reason for Brexit? Is EU benefit tourism a good reason for Brexit? Is the housing crisis a good reason for Brexit? Is EU health tourism a good reason for Brexit? Are EU directives and regulations a good reason for Brexit? Is the state of the education system a good reason for Brexit? Is the EU the cause of austerity, low productivity and stagnating wages in the UK? Is the UK paying more than its fair share and getting little out of the EU? Is having the Euro (one currency in 19 countries out of 28) so bad? Is being able to visit, study and work in 28 countries so bad? Is being able to own a second home and retire in 28 countries so bad? Is having common trade arrangements in 28 countries so bad? Is having common environmental standards in 28 countries so bad? Is having common consumer protection in 28 countries so bad? Is reducing the time, stress, cost, etc. across 28 countries so bad? Is the EU undemocratic, out of touch and beyond reform? Is Britain better or worse off within the EU? Is the EU better or worse off with Britain in the EU? Are you better off with Britain in the EU or not? If I were the average voter, I would want an answer to these questions before casting my vote. I would also want the answers to be simple, short and to the point but backed-up by evidence. This is exactly what the AngloDeutsch Blog will seek to do from until the referendum. This will be a challenge, given my professional and other commitments, but I shall do my best to cover as many of these topics as I can over the next few months, starting with the EU’s freedom of movement of people.